At CES today, LG unveiled its latest lineup of 4K OLED and LCD TVs, complete with enhanced HDR and 120-fps functionality, Dolby Atmos immersive audio, the company’s new ThinQ artificial-intelligence technology, the new Alpha 9 intelligent processor, and full-array local dimming (FALD) backlighting. In all, LG rolled out nine 4K LG AI OLED TVs, ranging from 55 in. to 77 in., and seven 4K LG AI SUPER UHD TV models, ranging from 55 to 75 in. On the HDR front, all 2018 LG OLED and LG SUPER UHD AI TVs will feature 4K Cinema HDR, enabling support of all major HDR formats. LG has added support for Advanced HDR by Technicolor to its support for Dolby Vision, Hybrid Log Gamma (HLG), and HDR10. For Dolby Vision and Advanced HDR by Technicolor, LG ensures HDR quality through the use of dynamic–tone-mapping technology. However, HLG and HDR10 use either no metadata or static metadata, so LG’s 2018 TVs will process an HDR image dynamically through the company’s proprietary HDR solutions known as HLG Pro and HDR10 Pro. 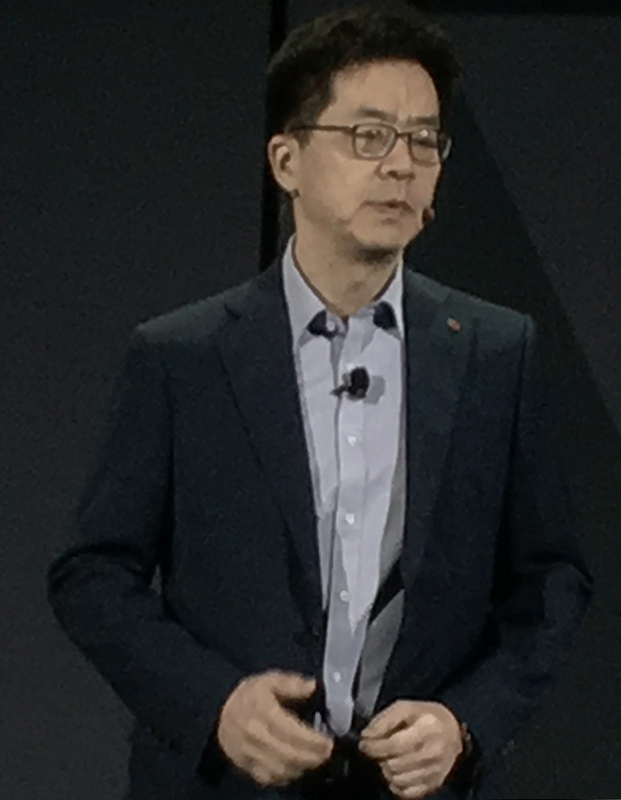 LG CTO Dr. IP Park opens the company’s CES 2018 press conference. All 2018 LG OLED and SUPER UHD TVs will also feature immersive Dolby Atmos audio. All 2018 4K UHD TVs will feature the company’s new ThinQ AI technology, enabling implementation of hundreds of voice requests, via LG’s webOS, as well as third-party AI services, such as Google Assistant and Amazon’s Alexa. With AI functionality embedded in 2018 LG TVs, LG’s customers can speak directly into the remote control to use all the features of today’s advanced voice-assistant technology. High-end OLED and SUPER UHD LCD sets will be powered by the new Alpha 9 intelligent processor. The company’s most powerful processor to date enhances image rendering and provides, in addition to OLED’s high-end black levels, more-accurate color from virtually any viewing angle. The Alpha 9 processor uses a four-step process to reduce picture noise (most TV sets use only two, according to LG), enabling more-effective smooth rendering of images. Although most TVs use edge-based depth enhancement, LG TVs use an object-based enhancer that can precisely separate main onscreen objects from the background. In terms of sharpness, the Alpha 9 processor separately analyzes textures and edges, which are then processed differently to make detection clearer and those edges sharper. The 2018 sets feature an expanded color-lookup table, which produces more-natural color by increasing the reference-color coordinates by more than seven times compared with the 2017 processor. The Alpha 9 processor also features high-frame-rate support up to 120 frames per second, removing judder or motion blur for high-action content like sports. Combining Nano Cell, FALD backlighting, and the Alpha 7 processor, LG’s 2018 SK9500 and SK9000 SUPER UHD LCD TVs will offer deeper blacks, enhanced image rendering, improved shadow details, and accurate color from wide viewing angles. The SUPER UHD TVs with FALD allow denser backlighting zones throughout the display, unlike edge lighting, in which backlights are positioned on the edges of the TV panel. LG’s technology improves black levels and picture dimensions by independent control of LED light zones, improving shadow details, and reducing light bleed for enhanced contrast and superb picture quality. Although LG did not address it during it’s CES press conference on Monday, the company is demoing a new rollable 65-incj OLED display prototype that builds on the 18-inch OLED display previously at CES. Not a lot is known about the prototype yet, but check out more info HERE courtesy of The Verge.